The silent protest went ahead last weekend at the Russian Embassy. The journalists' petition was handed in, containing over 1,400 names including those of many major newspaper editors. It appears that the piracy charges against Kieron and the rest of the Arctic 30 have not yet been formally dropped. "But Greenpeace spokesman Reece Turner says the activists appeared before the committee this week and the piracy charges remain. "All 30 of the Arctic 30, including Australian Colin Russell, are currently charged with piracy and hooliganism," he said." Hopefully this is simply be a procedural holdup. 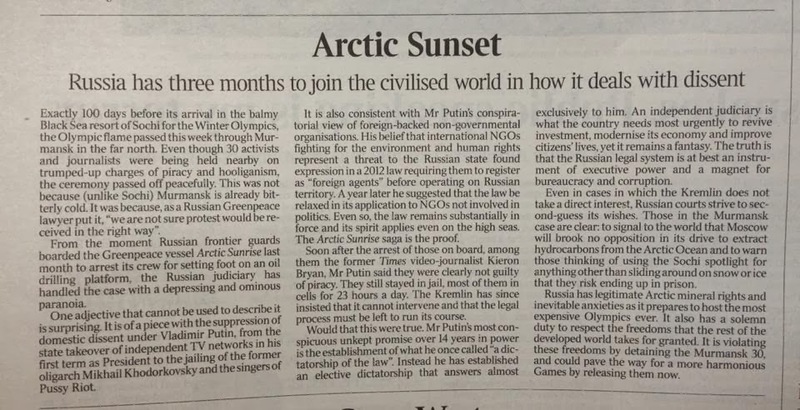 In the Sunday Times on the 3rd November, this leading article points out that this case risks tarnishing Russia's image at a time when the country will increasingly be under the spotlight. The Guardian on Monday carried an article by Judith Pallot, professor of the human geography of Russia at the University of Oxford. It contains some horrifying reading about the sizos, or remand prisons. "The foreign prisoners have each been allocated a metal bunk in a small cell occupied by four or five other prisoners, in which there is a washbasin, a cold-water tap, a tepid radiator, a toilet only partly concealed by a low partition, and a table and bench screwed to the floor next to the toilet. This is where they spend 23 hours of the day, where they eat, wash and defecate in close proximity to one another." Sky News also managed to obtain some video from inside the prison in Murmansk. "We managed to get rare access inside the prison in Murmansk to speak to the governor and raise the detainees' concerns. In response to a series of questions, he laughed and said: "In Great Britain your prisons are soft."" There is a possibility that Kieron will not have to suffer a Murmansk winter, as there are rumblings of the prisoners being moved to St Petersburg. This article in the Independent is more cautiously worded than some others, which imply that the 30 have already been moved. "Russia is preparing to move 30 Greenpeace activists arrested over a protest against Arctic drilling from the far-north city of Murmansk to St. Petersburg, the environmental group said on Friday." The timing or reason for this move have not been confirmed. It is certainly warmer in St Petersburg, given that is 1000 kilometres south of Murmansk. e) to immediately release the crew members of the Arctic Sunrise, and allow them to leave the territory and maritime areas under the jurisdiction of the Russian Federation." "The Russian Federation did not attend today's hearing and the sitting was closed following the presentation of the Dutch government's oral argumentation. The Netherlands will now lodge written answers to the Tribunal’s questions by the end of Thursday November 7. The presiding judge set a tentative date of Friday November 22 for the Tribunal's provisional order." At the moment it would appear that if the Tribunal orders Russia to release the ship and the thirty people who were aboard, they have no way of actually enforcing this. However it would be a hugely positive outcome if the tribunal rules in favour of the Dutch. "The ITLOS is a UN court, based in Hamburg. Founded in 1982, its decisions are binding – but it has no means of enforcing them." British Prime Minister David Cameron has spoken directly to Russian President Vladimir Putin about the situation. The BBC report here also contains an audio clip of an interview with Andy. "Mr Cameron said he spoke to the Russian leader earlier this week about the situation. "Their charges have been dropped from piracy to hooliganism, but I still think that is excessive. They are not hooligans, they are protesters," Mr Cameron told BBC Radio Devon." 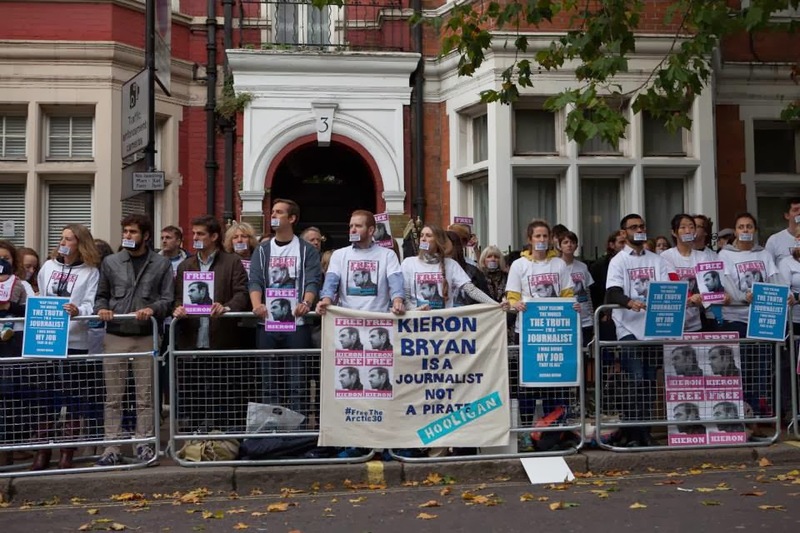 Kieron's elected representatives in London continue to support him. The London Assembly passed a motion demanding his release. 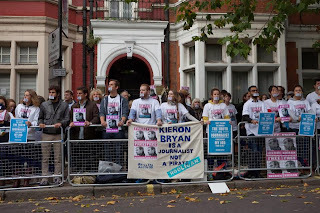 "The London Assembly today demanded the Russian government release journalist and London resident Kieron Bryan who has been imprisoned in Murmansk for 7 weeks." Harriet Harman, Kieron's MP, along with Geoffrey Cox, MP for Torridge, met with the Russian Ambassador to discuss the situation. "Constructive 1 & half hr mtg at @RussianEmbassy w/ Ambassador @Amb_Yakovenko & @Geoffrey_Cox re @FreeKieron Bryan pic.twitter.com/r3zLXPrE8Y"
"It is hard to know how much information Kieron is able to get as he faces a winter in a prison cell in Murmansk so many thousands of miles away. But I have written to him to let him know that as his MP, I am doing everything I can to bring his plight to the attention of the Government and put pressure on the Russian authorities. His family will leave no stone unturned until he is back with them and I will do everything I can to make that happen." Thank you to Harriet for her continued support and hard work to help Free Kieron. "5. 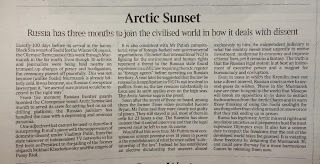 Why the Arctic Sunrise was detained? The vessel was detained in the Exclusive economic zone of Russia after members of its team entered without permit the 3 mile security zone around the rig, which has special security requirements and is closed for any unauthorised navigation or access, and attempted to disembark unlawfully onto the Prirazlomnaya. Thus, the Arctic Sunrise was used as a definite means to commit the offence." This three mile security zone has no basis in international law. "The hardest moment was the first night in prison – none of us knew where we were or what conditions the detention held, or whether we would be separated, left to navigate the unknown alone. Being shown to my cell and introduced to a couple of strangers was frightening, to say the least." This Greenpeace video uses actors to narrate some of the letters, including Kieron's. Kieron can be seen filming the events. Only a journalist would be filming when armed men are descending from a helicopter. Events to support Kieron's cause continue to be arranged. Tonight's Free Kieron benefit gig has comedy and music on the bill. There is a Murder Mystery staff play at Shebbear College on Friday 15th November, and a dinner and dance at Tommy Jack's in Bude on Friday 22nd November. It has now been over fifty days that Kieron has been impronised. Free Kieron.